March 25, 2011 - The Airbus Military A400M has completed a challenging series of tests to determine the lowest speed at which it can take off, known as minimum unstick speed or Vmu. During the tests, performed at Istres in France, the aircraft’s nose was raised until a special ‘bumper’ fitted to the rear fuselage struck the ground at the maximum pitch-up angle of 13º. The aircraft's maiden flight, originally planned for 2008, took place on December 11, 2009 in Seville, Spain. On January 9, 2009, Airbus announced that the first delivery has been postponed until at least 2012. Airbus also indicated that it wanted to renegotiate "certain technical characteristics" of the aircraft. 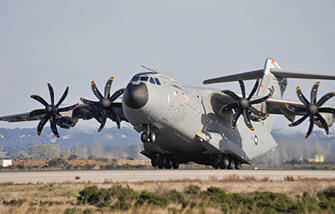 Airbus has long maintained the first deliveries would begin three years after the A400M's first flight. The German newspaper Financial Times Deutschland has closely followed the A400M program and reported in January 2009 that the aircraft was overweight by 12 tons and may not be able to achieve a critical performance requirement, the ability to airlift 32 tons. Sources told FTD at the time that the aircraft could only lift 29 tons, which is insufficient to carry a modern armored infantry fighting vehicle such as the Puma. The FTD report prompted the chief of the German Air Force to say, "That is a disastrous development," and could delay deliveries to the Luftwaffe until 2014. The Initial Operational Capability (IOC) for the Luftwaffe is delayed at least until 2017. This leads the political planning to potential alternatives in the shape of a higher integration of European airlift capabilities. The OCCAR reminded the participating countries that they can terminate the contract before March 31, 2009. On March 29, 2009, Airbus CEO Thomas Enders told Der Spiegel magazine that the program may need to be abandoned without changes. The shortage of military transports caused by the A400M delay forced the U.K. to lease, and subsequently purchase, six C-17s. France and Germany have also been considering other planes, as all three countries need to support their operations in Afghanistan. In June 2009, Lockheed Martin said that both United Kingdom and France had asked for technical details on the C-130J as an alternative to the A400M. On 12 June, The New York Times reported that Germany and France have delayed the decision whether or not to cancel their orders for another 6 months, while the UK still plans to decide at the end of June. The NYT also quotes a report to the French Senate from February 2009, according to which "the A400M is €5 billion over budget, 3 to 4 years behind schedule, aerospace experts estimate it is also costing Airbus between €1 billion and €1.5 billion a year." Airbus acknowledged in 2009 that the program is expected to lose at least 2.4 billion euros and cannot break even without sales outside NATO countries. A PricewaterhouseCoopers audit of the program projected that it would run €11.2 billion over budget unless corrective measures were taken, which would result in an overrun of only €7.6 billion. On July 24, 2009, the seven European nations announced that they would continue with the A400M program, and form a joint procurement agency to renegotiate the contract with EADS. The ministers of the seven European launch customers were supposed to meet October 15, 2009 in Germany to approve a new timetable, configuration and financial terms for the A400M airlifter. On October 14, 2009, French Ministry of Defense spokesman Laurent Teisseire, announced this meeting had been postponed. On December 9, 2009, the Financial Times reported that Airbus has asked for an additional €5bn subsidy to complete the project. On January 5, 2010, Airbus told the Financial Times again that the A400M program may be scrapped, costing Airbus €5.7bn unless €5.3bn is added by partner governments. On January 11, 2010, Tom Enders, Airbus chief executive, informed BBC World that he is prepared to cancel production of the A400M if European governments do not provide more funding. Delays to the A400M project have already increased its budget by 25%. It has now been announced that the project will still go ahead.